On the 19th October both of us, Elisa and Nina, implemented our workshop under the title "Happy thoughts! Positiv denken im Alltag" (=think positively on daily basis) in Graz. The workshop aimed to give an understanding how positive thinking can change the daily life and to provide tools which help to “get caught” in an upward spiral. The participants were encouraged to brainstorm about what makes them happy and what keeps them in positive mood and to share it with other people. With the help of visualization the participants got an idea of the upward and downward spiral. Moreover they got an theoretical input on “the happy chemicals” oxytocin, dopamine, serotonin and endorphin. It was explained what they are needed for and what provokes their production in the body. Afterwards the participants could experience some easy tools which can boost their mood in daily life. In the end it was showed how they can have an impact on themselves but also on the people around them and in their society. In order to have this workshop take place we needed participants to join our event. We did not have much time actually as we were pretty spontaneous with the idea and date which is why we were more than happy to have a local youth center (Logo Jugendzentrum Graz) as support. In order to inform people about our event and invite them we created an open event on Facebook and told everyone we knew about it. Both of us met a week before to plan the programme of the workshop session, to prepare the materials needed and to distribute further planning and responsibilities. On the day of the workshop we met early to go through the schedule again, talk last things through and to prepare our location. We were a bit nervous before our workshop as none of the participants had experience with non-formal learning before - but everything worked out amazingly well! Everybody participated fully :) We got lovely feedback right after the session but also some days later - and we definitely got our participants to be curious about Erasmus+ ! ... "Use Meditation, master Transitions and take Power-Breaks to direct your spotlight!". 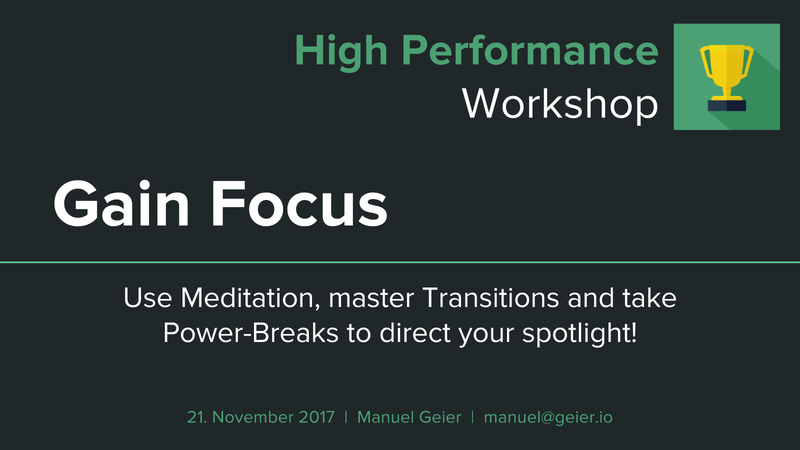 This was the title of my (Manuel's) workshop, I (Manuel) that took place on 21st of November 2017 in the Catalysts office in Vienna. For this workshop I used formal and non-formal learning methods to give the participants information as well as hands-on practice on different methods and techniques to keep their focus on their doings during the day. 13 participants joined my workshop to reach their next level. 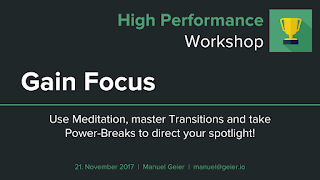 The workshop took around 1h 15 min and started with an introduction of myself, why I chose this topic and a little energizer to activate the body and the mind of the participants, followed by the three topics to gain focus: Meditation 101, Master Transitions and Power-Breaks. Check out the slides here. 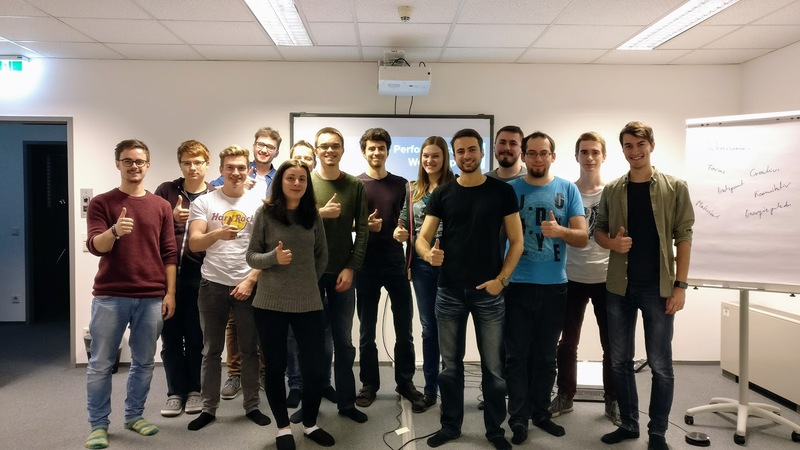 In general, I also talked about my experiences from the past (on how to improve myself and become a High Performer), why I chose the topic (I found lot of great information on my journey that helped me a lot, and I want to share it with others, such that they can improve their life too) and why I do this now (I did some trainings (e.g. Basic Training for Trainers) and I feel ready to do this kind of things and also the necessity to share the things I know... I want to make a transition from being a student to becoming a teacher). I got a lot of great feedback from the participants and from some already know, that they used some methods I taught, to improve their performance and life. Big thanks to all participants for the active involvement in my workshop. I enjoyed it a lot! If you want to have more background information about my workshop and tips&tricks, read the Behind the Scenes here! wEUnite is a youth organization found in 2014. Our main aim is to organize and take part in as many youth projects and exchanges as possible to give young people the opportunity to learn for life, see the world and create social contacts and friendships throughout Europe.